Bamboo springs immediately to mind when you think of China. It seems to be at the heart of many traditions and customs. Buildings and all sorts of handicrafts are made from it, and bamboo forms the diet of another great emblem of China the Giant Panda. Bamboo is a monster grass rather than a tree or shrub. Some species can grow 2 feet [61 cms] in a single day. Like other grasses it extends vertically to its full height in a few months while producing leaves at nodes. This growth pattern produces uniform cylindrical and un-branched stems making it ideal for all sorts of uses. The mature stem or cane, is called a ‘culm’, will remain strong for a few years before fungi rot it from the inside. In China there are 500 different species of bamboo. It grows chiefly in central and southern China where in places, bamboo can form whole forests and these account for about 5% of the forested area of China. It is grown as a timber crop in mountainous regions particularly Guangxi province. Bamboo can be found throughout South East Asia, Central and South America not just China; worldwide there are over 1,400 species. It grows best in moist climates with long growing seasons; only a few species can tolerate extreme cold. Species vary in height from a few inches up to 100 feet [30 meters]. It needs very few nutrients to grow and most species naturally regrow from buried seed when they are harvested making it a better alternative to traditional trees. Unlike many grasses, bamboo does not flower every year. It may be decades before it builds up sufficient reserves to flower and then the plant dies. The record for a bamboo species is a long wait of 120 years. To maximize the chance of pollination all separate plants of the same species will flower in the same year; so a large area will have bamboo plants of exactly the same age. It seems each plant has an internal clock to count the years before it decides to flower. For creatures relying on bamboo for food, mass flowering followed by death is a catastrophe to the herbivores that feed on it. For instance Giant Pandas are at risk from starvation after bamboo flowers because whole mountain sides are defoliated. For bamboo this is a clever strategy because all the pests and diseases will have been eradicated when it sprouts again from seeds. The character for bamboo 竹 zhú is made up of two sections of bamboo with leaves. As a radical it forms part of the many other characters: pen 笔 bǐ; calculate 算 suàn as pens and early abacuses were made from bamboo. It also forms part of the character for smile; laugh 笑 xiào, the derivation may be that of a person rocking heartily with laughter as the body sways like a bamboo. 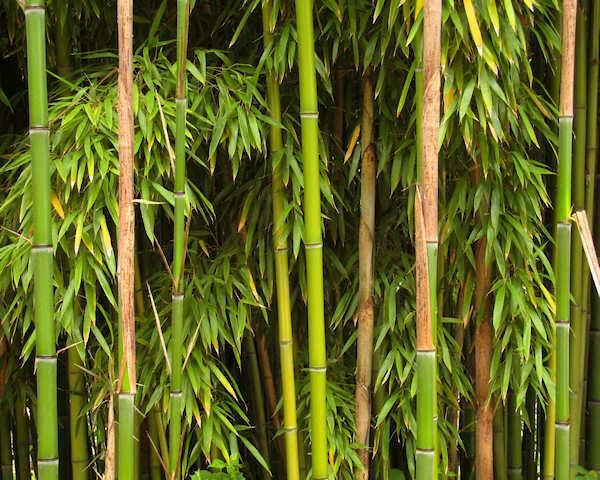 Bamboo was used for printing as far back as the Shang dynasty. Early writing was done on shorts strips of bamboo and these were tied together in bundles to form primitive ’books’. In this way a ‘book’ could be rolled up and easily carried. The ‘Bamboo Annals ➚’, written on bamboo strips, recorded the history of the kingdom of Jin back in the Zhou dynasty. After that bamboo was the main ingredient in paper. A Chinese bamboo book, open and unfolded to display the contents. This copy of The Art of War 孙子兵法 by Sun Wu is part of a collection at the University of California, Riverside ➚. It was either commissioned or transcribed by the Qing Emperor Qianlong. Bamboo stems were used as counting rods in the early Chinese form of the abacus. Multiplication tables dating back over 2,000 years have been found in Mongolia inscribed onto bamboo. A calligrapher's brush handle is traditionally made of bamboo and so it is closely associated with writing and calligraphy. Bamboo features heavily in paintings, perhaps for this reason. The famous poet Su Shi said ‘You can live without eating meat but you can not live without bamboo’. The fact that bamboo stems (culms) are hollow has been used to symbolize modesty. The internal divisions between sections are said to represent the steps to righteousness. In a painting it evokes peace and harmony. Some painters dedicate themselves to painting nothing except bamboo. Bamboo together with pine trees and plums are known as the ‘Three friends in winter’ as bamboo is evergreen. For more about the general symbolism of bamboo see our symbolism section. To complete the importance of bamboo to the scholar, pots for brushes are often made of finely decorated bamboo. Bamboo's tough fibers are a major constituent of early paper in China (a Chinese invention). The fibers can be made into cloth and then used for any purpose and will survive fifty washes. One of the most important uses has been in making rope, bamboo rope actually becomes stronger when wet and so are very useful in wells and deep drilling (for salt, gas). On the other hand the steamed young shoots of bamboo ➚ are eaten as a delicacy. Black bamboo has been used to treat kidney complaints. Gunpowder was packed into the hollow bamboo stems to make firecrackers. It produces poles of all lengths and diameters for all sorts of uses. It has been made into motorcycle helmets and bicycle frames. Bamboo tubes have been used as vases and flutes (called dizi ➚) for thousands of years. Stems could be flattened and marked to make dice for games of chance. Tubes have also been used for channeling the flow of 气 qì in traditional medicine. The strong, flexible culms are still widely used to carry water for irrigation. It has even been used for gas pipelines in the past. Its light weight and strength make it ideal for fishing poles and to support nets. A construction worker with bamboo scaffolding polls. Talk about battle strategy. An armchair general. Large culms are used as ‘timbers’ in housing and are strong enough to make sturdy scaffolding for skyscrapers as they are sturdier by weight than steel. It is tough enough to make houses out of it, it is estimated that 1 billion people live in bamboo houses. As it grows unbranched for a great length - up to 79 feet [24 meters] it has always been very suitable for making simple rafts. All that is needed is to lash together a few lengths of bamboo. Bamboo was used for the masts and timbers of junks, and also to brace the sails. When the bamboo stem is split, the pieces can be woven into baskets, screens and blinds and the foliage is often woven into baskets and hats. ...All this is very impressive for a type of grass! Citation information for this page : Chinasage, 'Cultivation and use of Bamboo in China', last updated 3 Dec 2016, Web, http://www.chinasage.info/bamboo.htm.